The MidWinter Midnight Soundscape: Perform it Yourself | MUSICAlive! 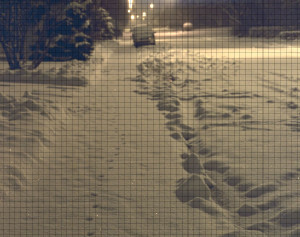 Strolling the snowfalling streets of Calgary after midnight is surreal and weirdly calming. This is a sound event of a different kind. Not specifically music, not specifically art, but a soundscape of a specifically local nature nonetheless. What could it be? What would we want to listen to, if it were not ‘music’ or ‘art’? What experience would merit such descriptions? It’s the winter. It’s the night. It’s the soft velvetness of it’s ‘little cat feet’ sinking down over the city as the darkness has deepened to midnight black, sun in the opposite hemisphere, people finally settling down to REM sleep. Taxis taking a break and buses heading for the barns. There’s a sound ‘darkness’ which settles in after midnight, in the winter cold, when the snow is absorbing excess energies, and the city is slowing it’s heartbeat. The lifebloods of the urban spaces are cooling under their blankets, settling into the gentler pulse of 1 or 2 in the morning. Unless you’ve stood outside in the midwinter midnight, watching your breath whisker away from your mouth, away from the blowers of furnaces and the electric hum of the transformers. or power lines, then you will have no concept of the space that this quiet creates all around you, all within you, all throughout you. It’s an experience of the night that cannot be known, or perhaps even expected, before it’s experienced. Think of the moment of sparkle you remember from that last visit to the grocery store, when the helpful passerby picked up your dropped glove, or the astounding flavour of the fries that came with the ordinary sandwich one time at lunch: something worth retaining and allowing to reform your ideas of the universe that surround you. Remember the echoing clarity of the pianist practicing that miraculous little tune in the building you entered to get your watch fixed, or the best sun-warmed moments you’ve had sitting by the river. A frosty coke. An unexpected kiss. The midnight, snow-cushioned temple of the urban space, so often alienating and isolating, can be something experienced like this. And so you must. Just put on a bunch of clothes late one night and check out the midwinter black. The city is different than the quiet of the rural environment: I can’t say why, but it is. Perhaps it’s the restricted animal and plant life in the city, Perhaps it’s the electromagnetic auras of hundreds of thousands of sleeping souls, Perhaps it’s just the acoustics of concrete and frozen water. But it’s right there, and it can be transformational, if you let it. If you trust me, you will.